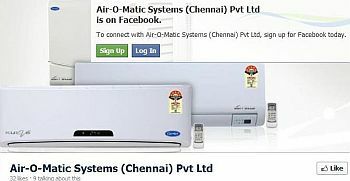 We at AIR-O-MATIC SYSTEMS are committed to safeguarding the privacy of our website visitors; this policy sets out how we will treat your personal information. (1) What do we collect? (c) Information relating to any transactions carried out between you and us on or in relation to this website, including information relating to any purchases you make of our goods or services. (d) Information that you provide to us for the purpose of subscribing to our website services, email notifications and/or newsletters and taking part in our 'Bid N Buy' programmes. (a) Administer the website, improve your browsing experience by personalizing the website, and enable your use of the services available on the website. (b) Send to you any goods purchased via the website, or provide to you, any services purchased via the website. (d) Send you general (non-marketing) commercial and non- commercial communications. (e) Send you email notifications on specific requests. (f) Send to you our newsletter and other marketing communications (relating to our business [or the businesses of carefully-selected third parties] which we think may be of interest to you by post or, where you have specifically agreed to this, by email or similar technology). (g) Provide third parties with statistical information about our users - but this information will not be used to identify any individual user. We may use any third party analytic program to analyse the use of this website. Analytic programs generate statistical and other information about website use by means of cookies, which are stored on users' computers. The information generated relating to our website is used to create reports about the use of the website.